How has the Islamic system been practiced throughout Muslim history, or given the state of justice in Muslim countries, how did these societies deteriorate after the death of the Prophet Mohammad? The emergence of corrupt rulers and their acceptance by Muslims thinkers (supporting tyrannical rule with a ridiculous interpretation of one verse in the Qur’an) and Muslims generally had a corrosive effect on governance in Muslim communities. Justice was no longer a system with just governance structure as its anchor. Governance authority obtained by terror, fear and money could not have rightful claim to being just. Arab society returned to the philosophy of “might makes right” of its pre-Islamic period. 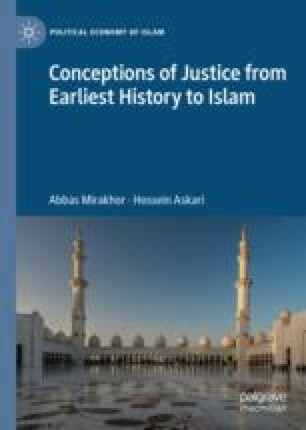 The views of early Muslim thinkers—Al-Kindi, Al-Farabi, Al-Razi, Ibn Sina, Maskuyah and al-Tusi—on justice are discussed.